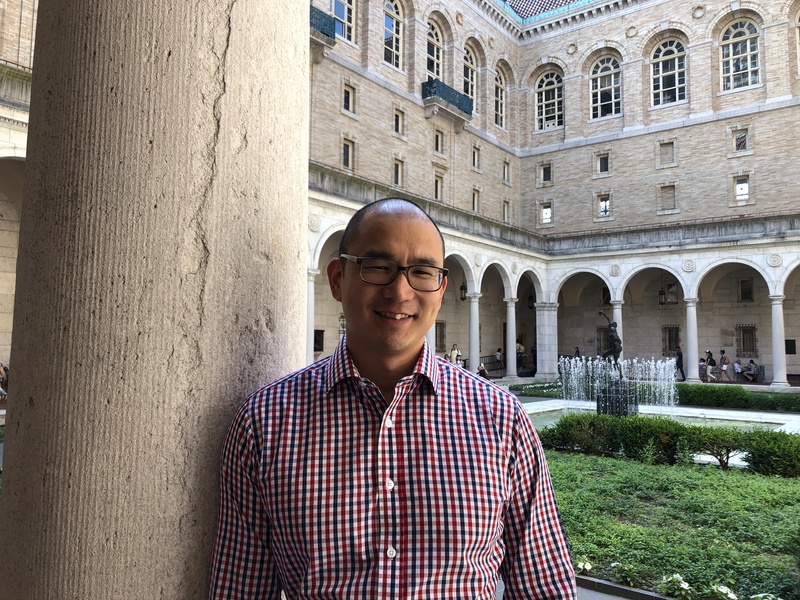 Boston Public Library’s new Director of Strategic Partnerships, Ben Hires, has used his multifaceted background to embrace what it means to be an artist as citizen and looks forward toward a future of cross-collaboration. I was lucky enough this week to tour the main library with Hires and it’s truly a magical place. Everywhere I looked there were performances happening: radio shows, concerts in the courtyard, architecture tours… It was truly remarkable, and here’s the thing--this happens everyday! The library is a bustling place of activity and experiences, a sort of Bostonian Mecca. How is this all possible? Hires entered Boston University with the intention of becoming a lawyer but when faced with the LSAT’s, Hires realized that maybe he wasn’t interested in joining the legal world. Hires’ background is in philosophy and political science so when it was suggested to him that he apply for a Master’s in Theological Studies where he could continue to study literature, ethics, philosophy, and religion, it seemed like the perfect way to continue his education while figuring out what he wanted to do. A work-study job at the Boston Youth Symphony Orchestra led him to working at the New England String Ensemble. A collaboration between the New England String Ensemble and the Boston Children’s Choir led to a job as Director of Programs for the BCC until ultimately he landed a job at the Boston Public Library as their Director of Strategic Partnerships. What makes this trajectory so interesting is that collaborations and being able to draw connections between different organizations played a pivotal role in Hires’ career. This shouldn’t come as much of a surprise but it’s worth noting that whether we’re taking with Betsi Graves or Maria Finkelmeier or Matt Szymanski, collaboration is always part of the foundation for success. Do you feel like your background in philosophy, theology, and political science has influenced how you approach the job today? Good question, yeah! I feel like being at the library is like coming home. Working at the library is really a combination of a lot of pieces of my background. Maybe it’s me or maybe it’s just the course of studies I’ve had, but I’m very curious; I ask a lot of questions. They’re all very philosophical, theoretical, existential, everything and I guess the point is about connecting the dots, thinking about that there’s something greater than just myself like there’s something greater than my organization, there’s meaning outside of myself and my organization. When you put two things together you’ve just sort of doubled the impact and doubled the meaning. You put three things together, four, five and suddenly you have this great, wonderful, new thing. It mirrors the creative process in that before there was nothing and now there is something which could be either a creative idea in someone’s mind or a tune that someone creates. When you think about it at an organizational level or individual level, you’ve just created a new relationship, you’ve just created a new program that didn’t exist before. I think I'm the type of person who can look for those questions and ask the questions like, “What if... What if we did this with this person, what could happen?” Did it come from my background of having to write 12 page philosophy papers? It probably does to some extent. I mean you had to write papers and make connections between different writers and thoughts and thinking. You had to compare and contrast peoples’ thoughts and ideas and draw connections; what can the library do with the Children’s Museum or the MFA or the Children’s Chorus. What can the library do with ArtsEmerson? What are things that we’re doing that are similar? What are the things that we’re not doing that maybe if we asked that question, can suddenly come together in a new way? I feel like I have a very fun, exciting, interesting job. It’s like a journey-- you don’t maybe exactly have the map, but you do know that you want to get to a certain place and you kind of need to uncover things. It’s like Legos where you have a pile of Legos and you don’t know what you’re going to make, but you just start fiddling and putting things together and suddenly have this cool object. Yeah, I think with art and creativity and jobs like this, you kind of have to have that spirit! At the end of the day, it’s about creating impact! You are the inaugural Director of Strategic Partnerships at the library, what was the reason that this job was created? Libraries, in particular the BPL, have had a bit of a Renaissance. On any given day, you’ve got a radio show happening, you’ve got a concert in the Courtyard, there are youth programs happening, there’s an author talk over here, so there’s just a of lot activity and a lot of arts & culture is a part of that! There’s the traditional library you and I and our parents grew up with, which was that libraries are where books are and you go to be quiet and to check things out, etc etc. Today that’s still the case, it’s a resource for people, it’s a source of knowledge for people, but it’s also a place where people come to make connections, to learn from one another, to enjoy the way the cultural and intellectual life of their city. There’s an opportunity for the library to be thinking about how to meet that new desire for connection and energy and programming . Your typical library staff are doing all of the typical things that libraries need to do, they’re helping patrons with books, they’re doing youth programming. So my job is to be an added muscle to thinking strategically about how do we do that additional work that now is a priority. It’s also in conjunction with the capital improvements that the BPL, the mayor, and the city have invested in the system. We create this whole wonderful space now and we have all of these other new branches and we see the statistics that show that the use of the library doubles when you have a new branch. People are pouring in and they’re looking to have wonderful programs so there needs to be this muscle about how to manage that strategically and sustain that financially, because all of those programs and activities require support. Part of my job and this role is also thinking about how to collaborate with other organizations to raise funds to support that work, make connections. My job is to think about what’s going on across the library, what’s going on across the city so that we can tap into to create something bigger with larger impact. That’s why this job is important. In early July, Boston Public Library and the Mayor’s Office of Arts & Culture launched a “Love Letter to a Library” public art collaboration with Steve Locke. 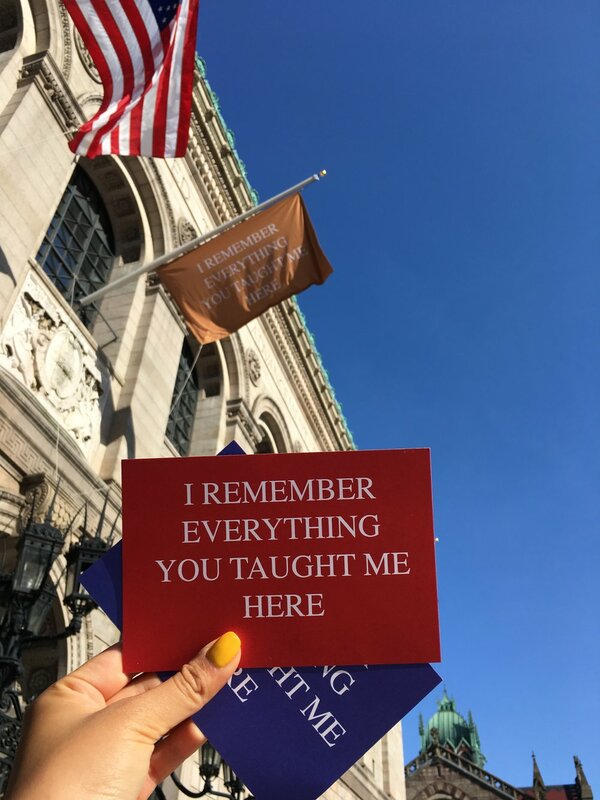 "I Remember Everything You Taught Me Here," is "intended to encourage viewers to engage with libraries as sites of learning, discourse, and memory" Steve Locke is the project creator and a City of Boston Artist-in-Residence. It seems like the library is a much more active place then than I remember as a child, do you think that has arisen from the need to combat digitization? I don’t know if combat is the right word. Digitization is actually big part of what the library does. We digitize books and that’s been incredibly impactful. We also have our whole Special Collections which is getting digitized and all of that is happening just to make things more accessible. That’s part of the mission of the library: to make things-- resources, knowledge, and experiences, more accessible. The library is not necessarily meeting its mission if it is not being at the front-edge of digital life. The library is also making experiences accessible so you see all of those programs happening day in and day out, because that’s how people are seeing the library. It’s not only a place to get an e-book, but it’s also a place to get access to a performance, or a story time for a child. Right on the front of the building, and one of the unique things about the library, is that it says it is FREE FOR ALL, which is a core tenet of the missions. We’re the first public library; we’re the first library to give out books for people to check out because not everybody has access to that high quality arts in their life. They can’t pay for a ticket, they don’t come downtown, they’ve never been in a concert hall; whatever the thing is that just makes it not part of their daily lives, that same person may come to the library for a book, or may just come to the library to access the internet to look for jobs so the fact that there are these other activities happening that are at their fingertips is kind of an amazing, democratic approach to life. This is the place to come to so you can fill your spirit up in all different kinds of ways, this is the place you can come to increase your economic opportunity. This is the place you can come to to get information about your health, because there’s lot of people who just don’t have that access so the library is that place that they can come to. I think it was the Pew Research Center that published a study that said that the library and the military are the two most trusted institutions in the country. People trust that when people come to the library, they get truthful, factual information. You don’t have to be rich to come here, you don’t have to be poor to come here. Everybody’s welcome and so it’s not only our mission, but our duty to make all of these wonderful resources accessible, including arts & culture. I see the library as the holding place of human knowledge. We have millions of books, and we have a Special Collections that has these cuneiform things from 200 B.C. but we also have these artifacts, these papers, these rare books, these magazines, this digital archive. I mean they’re really the archive of human history if you think about it. Any topic, any thought is in a book, it’s kind of interesting to think about the library being the repository of our humanity. It doesn’t matter who you are or what your background is, you have all of the knowledge of human history at your fingertips. You’re right, it’s not just the knowledge of one group of people, it’s the knowledge of everyone. It’s that special place that even if you don’t own a painting or mural at your house, you can come see our John Singer Sargent murals. I mean obviously you can’t own every book but you can come here and read mystery books or science fiction books or whatever you’re interested in. One of my favorite statements that I've read about this position is that you're using art as a catalyst for addressing some of the country's most pressing issues such as race, socio-economics, and gender. I love how accessible that mission is for everyone! That’s definitely a vision that I learned at the BCC. Again, I really appreciate working with young people because they really are the future, literally and figuratively, and so to use something that they might be passionate about, like singing or playing an instrument or writing, and focusing that on an issue that affects them as not only young people but as all of us because we live in this society and country and world together. They are more likely to be the ones to solve the problem as opposed to us adults who are sometimes so entrenched in our own ideas that we are not always thinking creatively. Obviously young people are so creative and so visionary that giving them the tools to think about these ideas is a really smart way to tackle issues. People don’t always see young people as sources of knowledge, but the things that come from the mouths of babes can be amazing. We’re trying to get people to stop and think and hopefully make a change in their life through arts & culture.